In this magisterial volume, Morton A. Kaplan examines the current state of international relations theory. Kaplan argues that in the area of qualitative macrosystem analysis, with a few exceptions, the discipline has not yet attained genuine professional status. In this book, he offers both a systematic review of current theory and a succinct account of his own theories of international relations. The extensive initial essay constitutes the most systematic analysis of the art of criticism in the literature. Kaplan examines the critical literature in international relations theory and demonstrates convincingly that it is substandard in professional terms-that it does not adequately represent theoretical work, that it misuses authorities, and that it fails to understand the problems of theory in social science. Kaplan engages one of his ablest critics, Kenneth Waltz, in a sustained dialogue. In disentangling his work from the misinterpretations of his critics, he provides a “key” to the understanding of System of Process in International Politics, which is generally acknowledged as the foremost theoretical work in the field. misused evidence. The field of diplomatic history, Kaplan concludes, is in a pre-professional state. 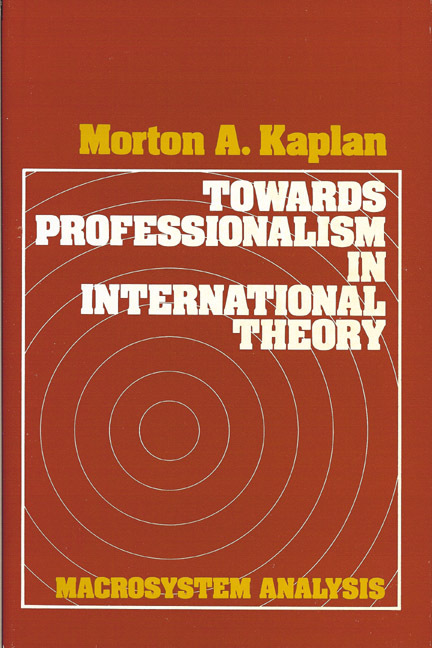 In Towards Professionalism in International Theory, Morton A. Kaplan is concerned with initiating genuine dialogue among scholars of international relations. The powers of insight and analysis he brings to bear on the subject make this an essential work for international relations and diplomatic history specialists, and for political scientists interested in the problem of theory in the social sciences. MORTON A. KAPLAN is Professor of Political Science, Chairman of the Committee on International Relations, and Director of the Center for Strategic and Foreign Policy Studies at the University of Chicago. Among his numerous books are these Free Press titles: Justice, Human Nature, and Political Obligation; Alienation and Identification; Isolation or Interdependence? and The Many Faces of Communism, both of which he edited; and Japan, America, and the Future World Order, which he co-edited with Kinhide Mushakoji.